Slacklining is a dynamic balance sport, which involves walking, balancing, bouncing and even flipping on a stretchy line tensioned between two trees or anchor points. Walking across a slackline is like bouncing across a very thin trampoline. The sport originates from Yosemite Valley, California in the late 1970s, where climbers practiced balancing and surfing on chains around car parks. When the climbers progressed to rigging up climbing webbing and walking across it, the slackline was born. What sort of skills does it involve and how will these boost fitness levels? Slacklining is a continuous balance discipline and great for improving core strength, co-ordination, flexibility and focus. While Slacklining, you use your core muscles to uphold your centre of balance and your arms and legs as a counterbalance. As your muscles are constantly working to keep you on the line, your body is getting a continuous workout. The stronger you become in your core, the less you need to do with your arms. Although, once you can stay up for a while, just holding your arms up in the air with constant minor adjustments will get your shoulders burning! Once balancing has been mastered, slackliners can tackle freestyle moves such as jumps and flips. A way of training on a slackline that is very beneficial to general fitness involves stillness, for example holding yoga positions on the line. Suddenly seemingly simple stretches become an intense training exercise in strength and flexibility. What kind of person does it suit? What qualities does that person need? We have found slacklining to have a very universal appeal. People of all ages and abilities can enjoy balancing and walking on the lines. You may find it easier to master the line if you have previous experience of other balance sports, such as gymnastics or surfing, but after a bit of practise everyone can learn to walk the line. On a scale of 1-10, how difficult is it? When you first step onto a slackline, it can feel as difficult as a seven or eight, which makes it all the more rewarding when you do make it across the line. Once you have conquered this, it’s up to the slackliner how hard you want to push it regarding the tricks you’d like to learn. What is the best thing about slacklining? One of the best things about Slacklining is that it is a very social sport. It only takes a couple of minutes to set up and get a session going with friends on the park, at the beach or in your garden. Be warned, it is also highly addictive. Every time a beginner loses their balance and comes off the line, they get straight back up to see if they can get that little bit further along. This is why we always have very long queues at events as people are desperate to have another go. It also has very good meditative qualities – once you step onto the line, all other thoughts leave your head – it really is just you and the line. Where can readers go for more information? 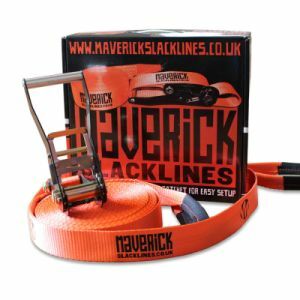 For further information and to join Maverick Slacklining Clubs across the UK, visit www.facebook.com/maverickslacklines. Slacklines cost around £45 for a decent one, but you can get an entry level slackline for around £20 which are available to buy online.